MILLVILLE, N.J. (January 30, 2019) – The Yamaha Champions Riding School (YCRS) will host its first ever school in Jupiter, Fla., February 26 -27 at Palm Beach International Raceway with support from MotoCorse Performance and TrackBikeRentals.com. The premium two-day ChampSchool will be the “main event” but YCRS will also save six less-expensive ChampDay seats for the 26th only and three seats on the 27th for prior YCRS graduates only. ChampSchool’s expansion into Arizona for winter training in 2014 turned out to be very successful and now with more bikes from Yamaha, YCRS hopes to make Florida the equal on the east coast in the winter. “The Yamaha Champions Riding School offers a world class motorcycle rider curriculum focused on the customer. Palm Beach International Raceway shares this commitment to customer satisfaction and we are extremely pleased to welcome them to our facility. We look forward to working with the entire staff of YCRS and hope that this event is only the beginning of a long and successful relationship between us,” Herb Lyman, Director of Road Course Development at PBIR said. MotoCorse Performance (www.motocorseperformance.com) will be the shop of choice for customers looking to get their bikes prepped for the school and www.trackbikerentals.com will be renting motorcycles to anyone who wants to travel from afar or just feel like a pro. Both reputable shops will be on hand for technical support of students and riders. 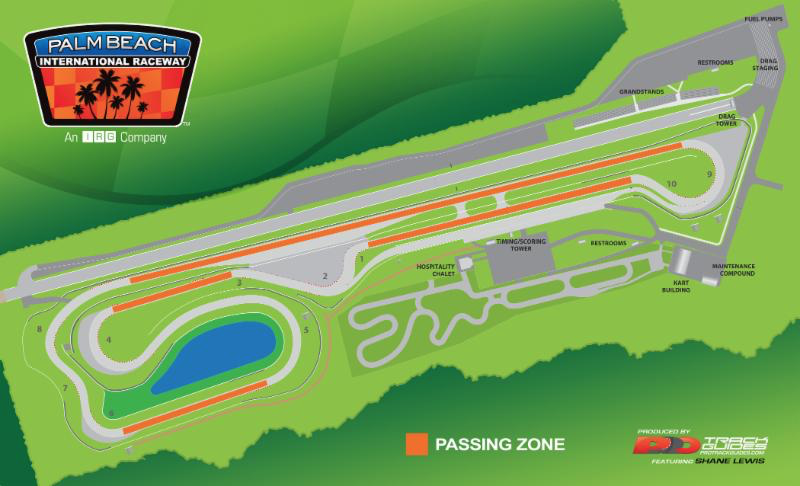 For more information about Palm Beach International Raceway visit RacePBIR.com. For more information, visit www.champschool.com , email teachme@champschool.com or do it the old fashioned way and speak with a human being, or even Chris Peris, via 855-RIDEYCRS (743-3927). Palm Beach International Raceway™ (PBIR) is an acclaimed motorsports and entertainment facility located in South Florida. The venue features a 2.2-mile road course, 8/10-mile go-kart track and an all-concrete 1/4-mile drag strip sanctioned by the International Hot Rod Association™ (IHRA). The state-of-the-art facility hosts over 350 events year-round which includes sportsman and professional drag racing, driving schools, endurance races, autocross, car shows and special events. PBIR is home to the Palm Beach Driving Club™ (PBDC), a private members-only club for automotive enthusiasts and resident driving school Bertil Roos Racing School. IRG Sports + Entertainment™ (IRGSE), a TPG Specialty Lending company, acquired PBIR in 2008. For more information on PBIR, please visit www.RacePBIR.com or connect with us on Facebook, Twitter and Instagram @RacePBIR. Yamaha Champions Riding School is the nation’s premier motorcycle training program. YCRS is the evolution of the Freddie Spencer High-Performance Riding School and is led by racer, author, and former right-hand man of Spencer, Nick Ienatsch. YCRS uses “Champions Habits” to teach all riders the skills and techniques used by the top riders in the world to go faster, stay safer, or both while concentrating on the way in which modern motorcycles are designed to be ridden. YCRS is dedicated to making all motorcycle riders safer and more in control of their riding, no matter what type of riding they do.